The Gulf of Thailand is a highly under-investigated area that experiences increases in anthropogenic stressors. Intense coastal development and mass tourism in the Gulf of Thailand result in overfishing and eutrophication. These factors cause uncontrolled proliferation of algae in coral reefs and lead to phase shifts which means a subsequent potential death of reef organisms. Our study aims to link predation by the fish community and the inorganic nutrient availability and their effect on the surrounding sediments. Therefore, overfishing (fish exclusion via cage deployment) and eutrophication (controlled addition of fertiliser) were simulated in the patch reef of Mae Haad, located in the Northwest of the island Koh Phangan, a typical bay influenced by tourism and river input. Sediment samples were collected weekly in addition to the assessment of key environmental parameters including background concentrations of inorganic nutrients, fish biomass and diversity, benthic community composition and water movement. The results show a significant effect of fish exclusion on the sediment surface cover and the sedimentary chlorophyll a content (as a measure of microphytobenthos) but not on the microbial activity. Unfortunately too little is known about limitations of microphytobenthos, a direct link between fish exclusion and microphytobenthos growth could not be established. Difference in microphyotbenthic growth and microbial activity in response to nutrient input could not be verified in this study. The photos taken every week of the sediment area in the subplots were used for comparison of the visible coverage.. Five categories were defined: almost clean sand (1), brownish colouring of the sand (2), appearance of fleshy algae (3), accentuation of the colour and larger distribution of fleshy algae (4) and algae mat (5). The observed lack of nutrient enrichment effects may indicate that nutrients are already present in high concentrations at the study location. Indeed, own supplementary measurements confirmed that high phosphate concentrations are entering the bay via river input. Mae Haad is a reef already impacted by pollution and fishing. 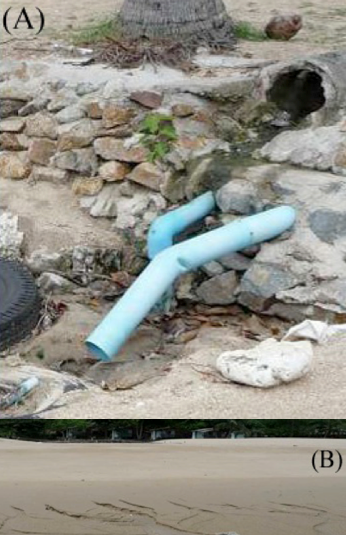 Pictures of waste water pipes originating from a resort in the north of the bay (A) and of river discharge at the beach (B). For future investigation, an understanding of benthic food-web relationships is essential, since it has implications not only for fundamental ecology but also for properly interpreting and predicting the effects of environmental perturbations: effects at one trophic level (fish, invertebrates, or microalgae) could lead to responses at another level. All results suggest that the investigated reef is already highly impacted by eutrophication and overfishing. Regular monitoring and more detailed investigations of site specific and setup properties may sharpen the picture.